Call us today for computer networking needs. Do you need telecommunications services in your office? Contact Goss Communications located in the College Station, TX and Brenham, TX areas. We specialize in computer systems and will sell, install, and repair any of our equipment for you. We offer telephone systems that come in various types. There are simple two line and one line phone systems, to more complex multi-line phone systems with hundreds of phone extensions, VOIP (Voice-Over-Internet-Protocol) systems, audio-video conferencing equipment, and computers. 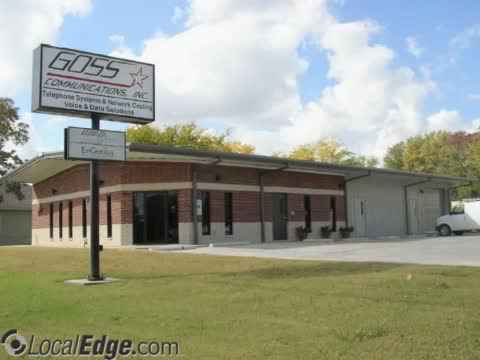 When you're looking for the finest service for your computer systems in the Brenham, TX and College Station, TX area, look no further than Goss Communications. From installing state of the art telephone systems to helping with your company's computer networking system, we are here to maximize your communication potential. Offering Computer Systems for Your Business! Goss Communications Inc is your College Station, TX small business computer systems and technology expert. We know running a small business requires you to wear many different hats, but leave the IT to us! We offer a full range of computer systems from top name brands and services that you can always rely on. Our goal is to help you run your business without any computer issues slowing you down or causing you to lose productivity. Reliable telephone systems are the backbone of many Brenham and College Station, TX businesses. Keep your lines of communication open round the clock with our systems, designed to cater to the need of any type of business. We offer options ranging from single or double line telephone systems to far more complex, multi-line systems that incorporate hundreds of phone lines. Whether you run a small business or a call center, we have the resources you need. Give us a call to learn more about the options we offer. We serve businesses of all sizes in College Station and the surrounding areas. We also install network cable for voice and data, including fiber-optics. Our technicians average 15 years of telecom communication and computer networking experience. Our primary service area includes all of South Central Texas, including College Station, TX. When you install computer systems, audio conferencing may be one option for you. Audio conferencing equipment offers enhanced sound quality that can often be used with many business telephone systems. You will be able to speak to your customers on a clear, distinct line. Today, video conferencing is more affordable and offers a cost-effective solution for bringing businesses together using communications technology. This alternative solution for remote offices brings businesses together in interactive settings without the time commitment and expense of travel. With the quality of images and video offered by today’s technology, the video-conferencing solution is the next best thing to being in the same room with conference participants. Goss Communications offers telephone systems to meet business communications needs for small and medium-sized companies. Our product lines include Avaya, Nortel, and Engenius wireless systems. We work with you to determine the features you need now and in the future, so that we can offer a system that has the capacity to grow with your company. Some options to consider are voice messaging, conferencing, headset support, and call forwarding. If you would like more traditional telephone systems, you can buy our "key" systems. Key-system telephone sets offer a button for each line available to that telephone set’s connection station. Key-system technology has advanced and enhanced features offered by many key systems include voice mail and messaging, conferencing, external connectivity (such as fax, credit card readers, etc. ), wireless phone and headset connectivity, call recording, back-up and data restore capabilities, line consolidation capabilities over T1 or PRI, and many other features. Goss Communications is an authorized reseller for EnGenius wireless systems. EnGenius products offer the longest range for phone systems that can legally be used in the United States. Depending on the conditions in the use area, the range capability can be up to five miles, and an external antenna can boost the range capability. EnGenius system capabilities offer a wireless solution that may be suitable for farm & ranch and large warehouse applications, depending on area conditions. Network cable installation is a common service that we provide. Our technicians can design an effective and efficient cable network for your telephone system, or we can install networks according to your plan specifications. Our technicians can also install computer network cable systems according to your plan specifications. Install our computer networking software today. Goss Communications employs certified installers to install optical fiber communications cabling systems. Fiber optic cable systems use light to transmit information. Fiber optics transmission encounters less interference and, therefore, offers superior transmission signals as compared to the more common copper cabling systems. Fiber optics systems are suitable for longer distance cable connections, and we commonly install the systems between buildings. You may choose from several leading brands for your computer networking system. Goss Communications Inc. sells Cisco, one of the leading suppliers of computer systems equipment and network management. They also sell Hewlett-Packard for both software and hardware. Last but not least, they offer Microsoft computer systems that make computing for businesses easier every day. These popular product lines and many more that we offer are what can bring your business to the next level. Call Goss Communications Inc., the telecommunications company with a variety of computer networking services. We are sure to have any of the computer systems products that you need. We are proud to serve the College Station, TX and Brenham, TX area.